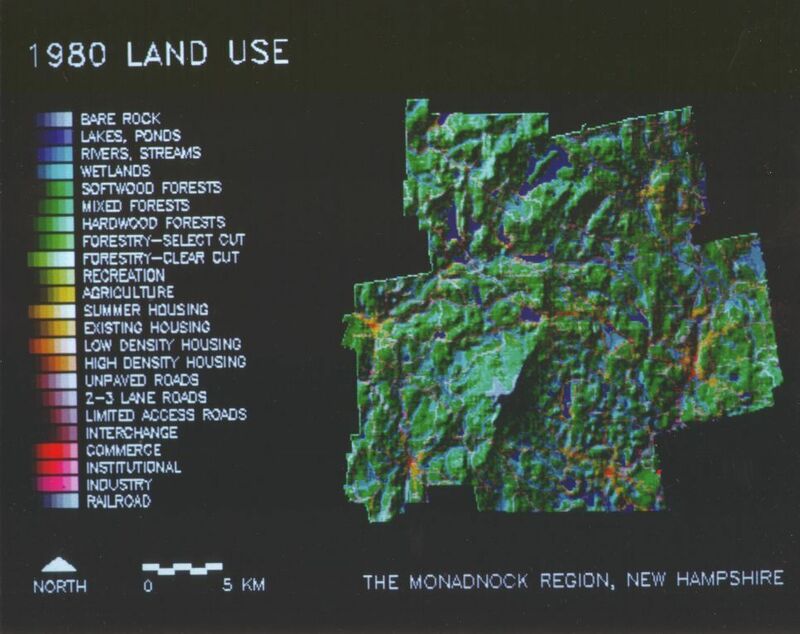 The data for this map were assembled from existing maps, field surveys, and Landsat imagery by the Fall 1981 Landscape Architecture Studio in Major Landscape Change. The map was created on an Advanced Electronic Designs 512 Imaging Terminal and reproduced on Polaroid 809 Color Print Film by a Dunn Instruments 631 Camera System. The mapping technique superimposes a map of shaded relief in seven levels of gray tones, onto a map of land use in twenty three spectrally encoded classes. Using this same technique, the studio also mapped 1890 land use, projected land use for the year 2000, and a series of landscape planning alternatives. Created in 1981 with co-authors Carl Steinitz and Douglas Johnston. See White D. 1985. Relief modulated thematic mapping by computer. The American Cartographer 12(1):62-68.